The Adam Audio T5V active monitor has been designed to fulfil the needs of DJs and producers who require an affordable two-way nearfield monitor for both studio and dj monitoring. Equipped with a 5" woofer which delivers a bass-frequency response to 45Hz and the new U-ART tweeter, the T5V is a breakthrough solution for those who desire high-resolution recording and mixing on a budget. Top end response reachs 25kHz and inherits waveguide technology from Adam Audio's flagship S series of monitors, the uniform dispersion of high frequenices delivers a wide sweet spot which is perect for DJs using the T5V to monitor their mixes. The T5V is capable of producing SPLs up to 106 dB per pair using a 50 W amplifier to drive the woofer, while a 20 W amplifier feeds the U-ART tweeter. A rear firing bass port, small footprint and built-in DSP controlled driver crossovers and equalisation combine with multi-way analog connections and a beveled cabinet to facilitate placement of the T5 anywhere in your room. Thanks to excellent acoustic characteristics, compact dimensions and a nice wide sweet spot, the Adam Audio T5V is the perfect studio monitor for DJs and producers seeking quality and affordability. 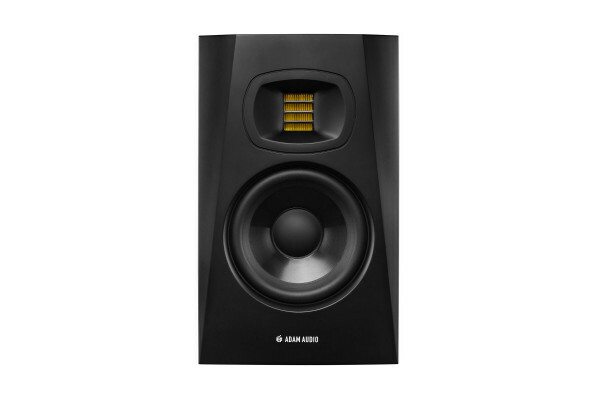 Seen the Adam Audio T5V Active Studio Monitor from another UK Dealer Cheaper?